DESCRIPTION – Braided Wreath with Bow, 4 inch diameter. $0.29 ea. $0.203 ea. $0.174 ea. $0.145 ea. $0.131 ea. $0.123 ea. $0.116 ea. $0.109 ea. DESCRIPTION – Grapevine Wreath, 3 inch diameter. $0.39 ea. $0.273 ea. $0.234 ea. $0.195 ea. $0.176 ea. $0.166 ea. $0.156 ea. $0.146 ea. DESCRIPTION – Grapevine Wreath, 4 inch diameter. $1.00 ea. $0.700 ea. $0.600 ea. $0.500 ea. $0.450 ea. $0.425 ea. $0.400 ea. $0.375 ea. DESCRIPTION – Set of 3 Twig Wreaths, 2 inch, 3.5 inch, 5 inch. DESCRIPTION – 2-inch twig wreath. DESCRIPTION – 3.5-inch twig wreath. DESCRIPTION – 5-inch twig wreath. DESCRIPTION – Twig Wreath, 6 inch diameter. 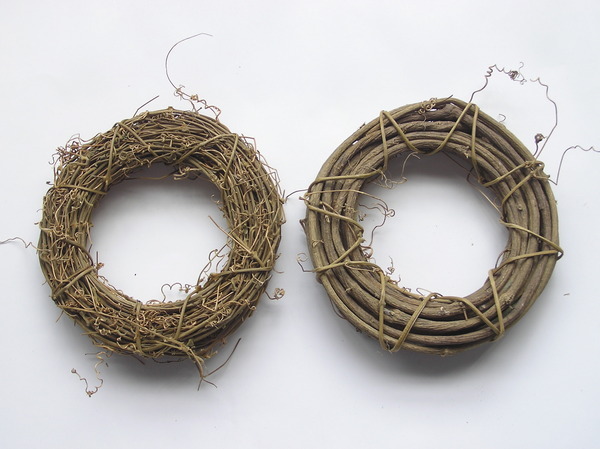 DESCRIPTION – Set of 3 twig wreaths - 2 inch, 3.5 inch, 5 inch. DESCRIPTION – Twisted Grapevine Wreath, 3 inch diameter.